The pop-punk scene grows stronger and stronger every day. 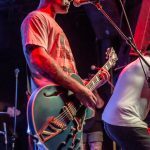 More and more people cram themselves in to small venues, like Soundbar in Orlando, Fl, just to hear that one band play that one song that makes them feel like they’re not alone in the world. 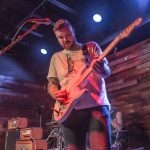 I was lucky enough to attend the sold-out show at the Soundbar to see Seaway and Trophy Eyes co-headlining tour The American Vacation Tour. On tour with them is Microwave, Can’t Swim and Hot Mulligan. I think my favorite thing is that Soundbar had fliers posted saying “No crowd killing” which, I guess, does not account against crowd surfing, mosh pits or even the classic stage dive. 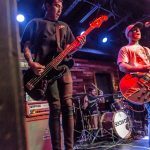 Kicking off the show was Hot Mulligan. Though I, personally, have never heard of them before that night, the crowd went crazy! Joined together, the crowd sang along as the band played their hearts out. They made a fan out of me and I highly recommend them if you are a huge fan of The Wonder Years and Knuckle Puck. The next band, Can’t Swim, was a lot heavier than Hot Mulligan and I know heavier than the other bands. Having that punk grunge sound was actually a delightful change in pace. It’s nice to have a band that is a bit different than the others and still able to fit in so well. Though I do not know them well, I remember seeing Microwave at the Full Sail Warped Tour Kick Off. I enjoyed them then, and I still enjoyed them now. 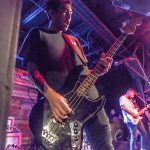 By the time Trophy Eyes took the stage, I thought the crowd would lose some of their energy…I was wrong. Then again, I think everyone was just warming up because not one person was standing still during their set. These boys from Australia hit the stage and gave 110% of their heart and soul to the crowd. You can tell that they are passionate about what they sing and what they want to bring to they’re fans. Though I have never really sat down and listened to Trophy Eyes before, they do pop up on my Spotify radio. I joined the crowd in singing “You can count on me” because for one, it was the only song I knew by heart, and two, it’s a song you can tell has a positive message though the lyrics are dark. Their raw vocals give an edgy vibe that really impact their fans as they listen to lyrics that they can relate to. You could also feel the vibration from the guitar in your soul and the pounding of the bass and drums in your heart. In feeling the music through your body, you could also feel the respect the fans have for the band in vise versa. 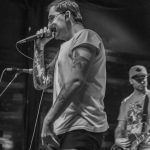 I do not remember the fist time seeing Seaway, but I remember buying both Colour Blind and Hoser and falling in love with both albums. 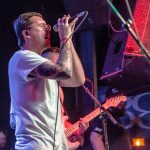 The energy that Seaway brings to the stage is still the pop punk vibe you’re looking for but it’s almost a different feeling, especially with their new album Vacation. Again, to think that the crowd would have lost some of their energy by the time they hit the stage, but nope; this was the craziest I have seen the crowd. I feel like with international pop-punk bands, they always have the best crowd. My favorite about them is they have a tambourine in most of their songs, so when they played “Something Wonderful”, lead singer Ryan Locke rocked that tambourine. They’re songs are almost like feel good anthems that you can’t help but smile, sing and mosh along to. 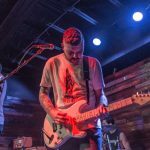 Just like the bands before them, Seaway pours their heart and soul on to the stage. Every time I have seen them, they have a moment where their energy drops. All in all, the show itself was amazing. The lineup was put together well and the crowd was having the time of their life. Concerts are all about bring people together to enjoy someone’s art as well as reminding everyone that, even if you feel alone, you’re never truly alone. There will always be that one song from that one band that will make everything in life okay. 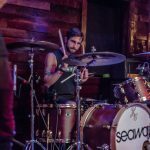 I highly recommend checking out each and every band as well as checking out Vacation, Seaways new album, which can be stream on Spotify or pandora and even purchased on iTunes.